Brenchel arrive at the salami. Rachel knows salami is on pizza. And she likes pizza. Kerri & Stacy are so far behind! Kentucky caught up to them at the museum. Kerri & Stacy get their clue and leave. You knew that the beheading of the statue was coming. YOUR BITCHING AT ME! Its like your favorite thing to do in the whole world! Nary & Jamie take out the head of the statue. This is great. Country girls are on to the salami. Bopper and Mark got the coin. Rachel and Dave got off with the clue! Make you way to the pit stop! Rachel & Dave finish cleaning the statue and head to the pit stop. After all of their conflict! Brenchel can't name their salami. Nary decapitates her statue too. Nary is shocked. Can I just say I love this? Brenchel get the first few salami but then they guess one wrong. They have to go back to the salami shop. Kerri & Stacey pick salami. Davechel finish the detour in 2nd. Pit stop! Go to Piazza Castello. Jamie: Going to a toga party... She's going to look hot! Joey & Danny finish the detour in 3rd. Vanessa & Ralph finish in 4th. Dave with "Utter Failure" again. Rachel and Dave are team number 2!! Kerri and Stacey begin the detour. They got the title quote. Oh, Rachel is crying again. "Stop holding my hand!" OMG. 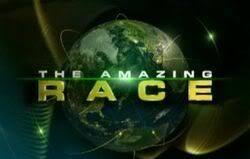 The Amazing Race is supposed to be fun and good! I want to be on Big Brother again! Kerri... or Stacy: We have to taste... your... salami. Kerri & Stacy catch up to Brenchel. Brenchel are now going to guess. Another Brenchel freakout. Rachel: I might purposely jump in front of a car. Rachel is freaking out because she can't guess any of the salami anymore. "We're out of Amazing Race" - Brendon. Oh gosh. The context and timing of the episode title is HILARIOUS! Brenchel is just EPIC on this leg!!!!! Brendon talks Rachel to continue. Please don't do that. Oh god, Brenchel continue. Oh no. Brendon: "We're out of the Amazing Race..."
Rachel: "Brendon, stop saying that!" Bopper & Mark get their clue. Nary & Jamie finish the detour in 5th. Joey and Danny check in 3rd. Vanessa & Ralph are 4th. Brenchel finally get their clue! Nary & Jamie are in 5th. Kerri & Stacy finish the detour. Brenchel are in 6th. Rachel: Sometimes we're more frenemies than friends. Bopper & Mark do the statue detour. They have a lot of fun. The clue person: Are you two engaged? Kerri & Stacy are team #7.